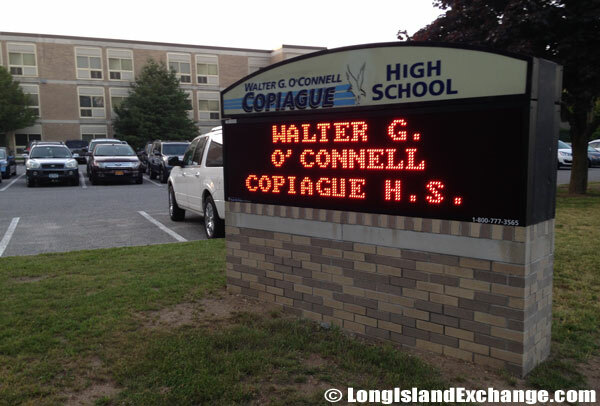 Copiague is a hamlet and census-designated place located in Suffolk County, on the South Shore of Long Island to the east of Amityville, New York and to the west of Lindenhurst. It is in the Township of Babylon about 35 miles east of New York City and 70 miles west of Montauk Point. The area is home to large Polish-American residents. As of the 2010 census, there were 22,993 people, 7,054 households, and 5,083 families residing in the CDP. The median income for a household in the CDP was $71,828, and the median income for a family was $81,070. Males had a median income of $50,948 and just $36,267 for females. The latitude of Copiague is 40.681N. The longitude is -73.4W. It is in the Eastern Standard time zone. Elevation is 23 feet. 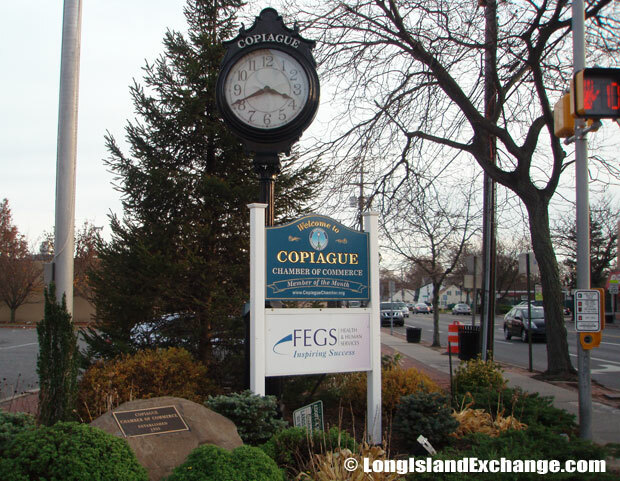 A sign welcomes visitors and residents to the hamlet of Copiague at the Southeastern corner of Great East Neck Road and Oak Street, Copiague NY, a spot also shared with the local Chamber of Commerce to highlight its member of the month. 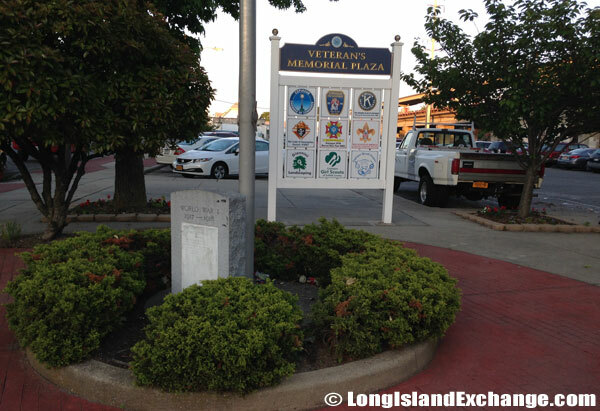 Veteran’s Memorial Plaza is located at Marconi Blvd. and Great Neck Road, boasts a striking logo sign, landscaping and two new park benches each donated by the Copiague Chamber of Commerce and the Kiwanis Club of Copiague. 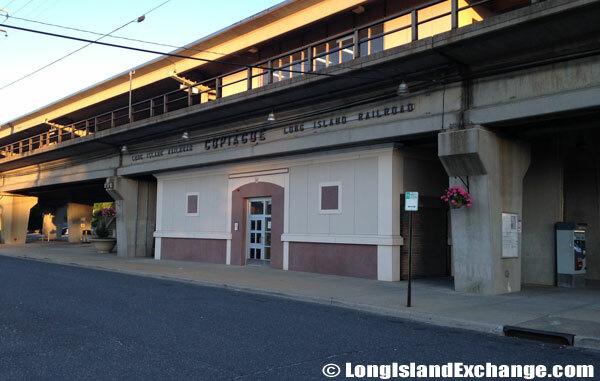 Copiague is a station on the Babylon Branch of the Long Island Rail Road. The station is located on Marconi Boulevard and Great Neck Road one block north of Oak Street. The name “Copiague” comes from the Merrick Indian word meaning “Sheltered Harbor” or “Sheltered place”. The area was early settled by baymen, farmers, and tradesmen. In 1693, Chief Wyandanch sold land, which included Copiague, to early settlers, who renamed it South Huntington, for 12 coats, 20 pounds of gunpowder, 20 hatchets and 20 knives. It has gone through several name changes. A welcome to Copiague sign along side Montauk Highway, Copiague NY. 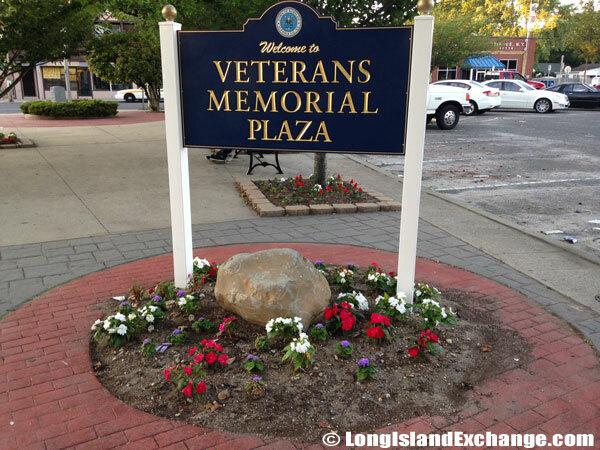 Veteran’s Memorial Plaza was made possible by the Town of Babylon and the Town of Babylon’s Beautification Department. In the 1666 deed for the area is stated to be a “passel of meddow” being in a neck commonly called by the Indians “Coppiage”. 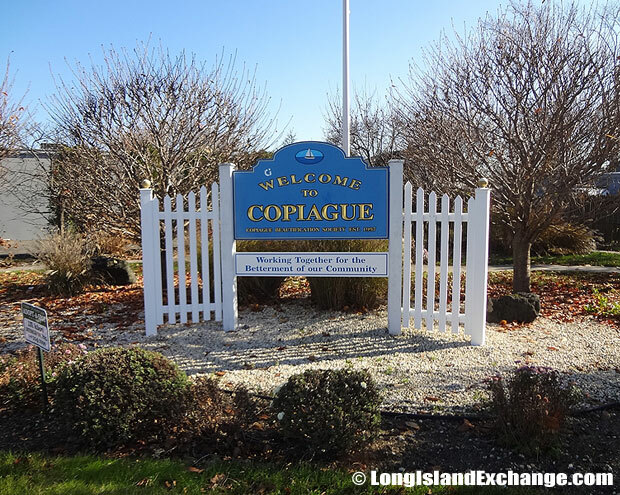 In 1895, the hamlet was officially named Copiague. Like many early towns on Long Island, much of the land was used for farming. A gristmill was built located on the north side of South Road (Merrick Road) owned and operated by Thomas Ireland. In later years, a saw mill and cloth mill were also built. 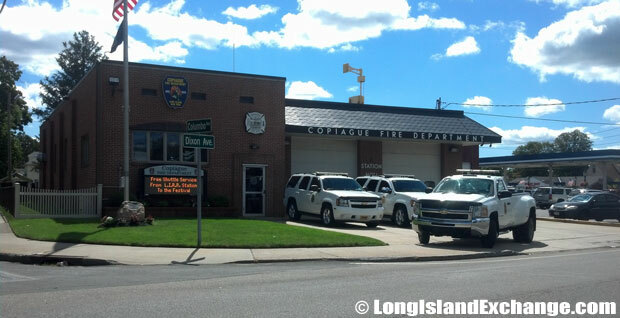 Copiague Fire Department, Great East Neck Road, Copiague NY. 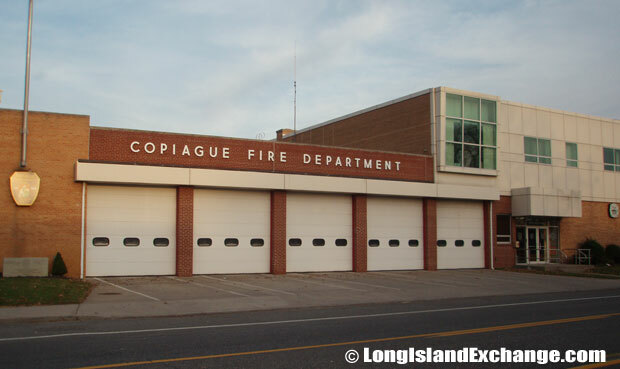 Copiague Fire Department was founded in 1928. 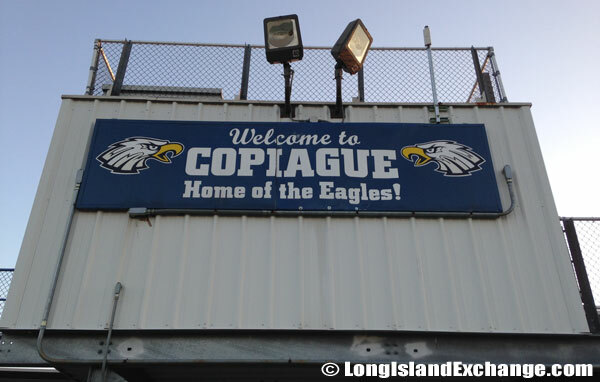 A sign on the back of the bleachers at the high school showing the Copiague High School mascot as the Eagles with the colors of royal blue, white and yellow. 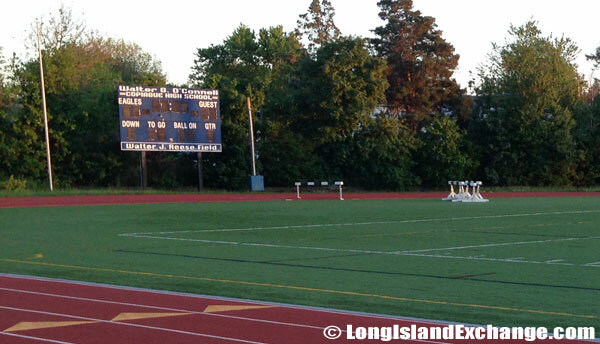 Walter G. O’Connell Copiague High School track and football field. The Copiague Harbor is also known as Great South Bay Estates and the “Harbor” to other Copiague residents. It is a small upscale community located on a southern peninsula within the hamlet of Copiague. The community offers amenities including a mini-beach and mini-marina on a private lagoon. 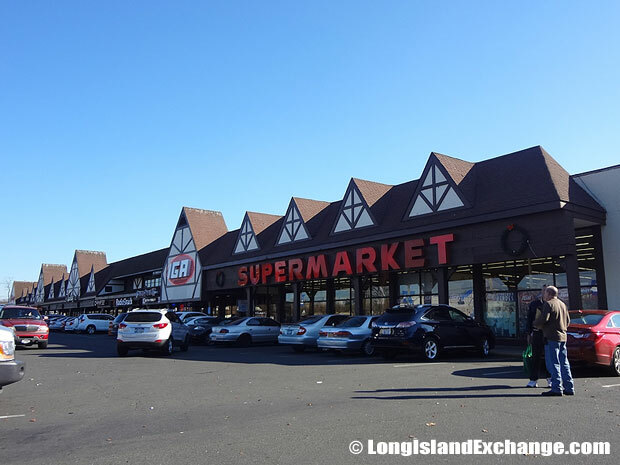 Merrineck Shopping Center, or by its business name Merrineck Plaza, is located at the corner of Great East Neck Road and Montauk Highway, Copiague NY. Well-known residents include Guglielmo Marconi, inventor (summer resident) and Zebulon Ketcham, Revolutionary patriot. 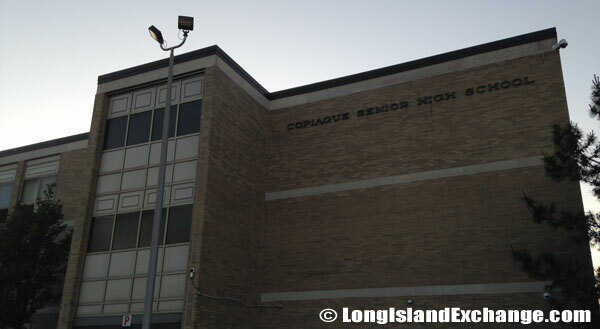 The Copiague Public School District consists of three elementary schools, one middle school for grades six through eight, and one high school for grades nine through twelve. It offers quality educational programs that will enhance every student learning skills. The area has two historical Native American and Civil War burial grounds. Copiague Fire Department, Dixon Avenue and Great East Neck Road, Copiague NY. 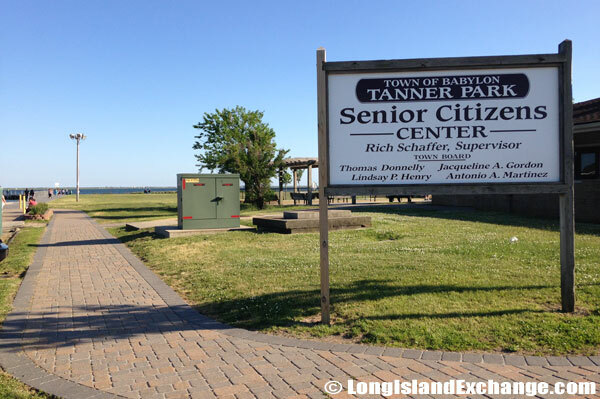 The Tanner Park Senior Center is located at #2 Tanner Park in Copiague. Here seniors take in the beautiful waterfront sights that the location provides. Looking out to the Great South Bay from the Tanner Park Senior Center area. Copiague’s Italian influence can be surprising to those who are not aware of the high proportion of early and prominent settlers who came from this particular part of Europe. Parts of the village were once made to look like Venice with gondolas and canals and streets continue to have common Italian names. 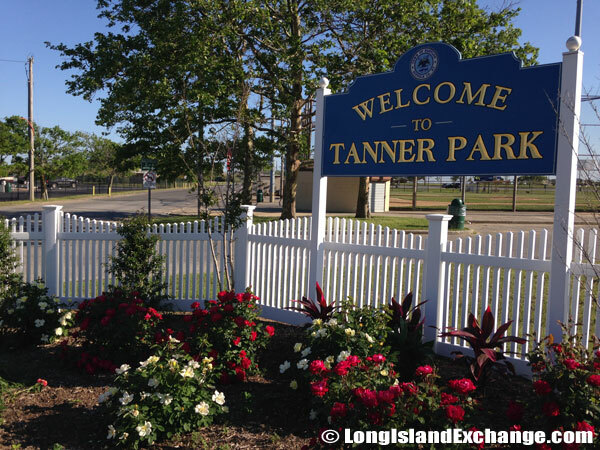 A sign welcomes visitors and residents to Tanner Park, a public park in Copiague. 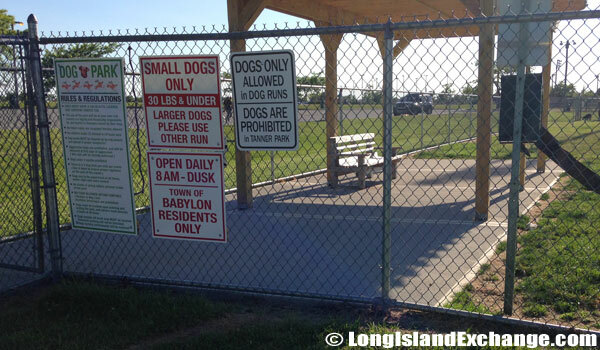 Tanner Park offers two dog run areas in its dog park; one which is for 30 lbs and under and a larger run for all dogs. The dog runs are on the north end of the park just inside the entrance and are the only areas within the park where dogs are permitted. 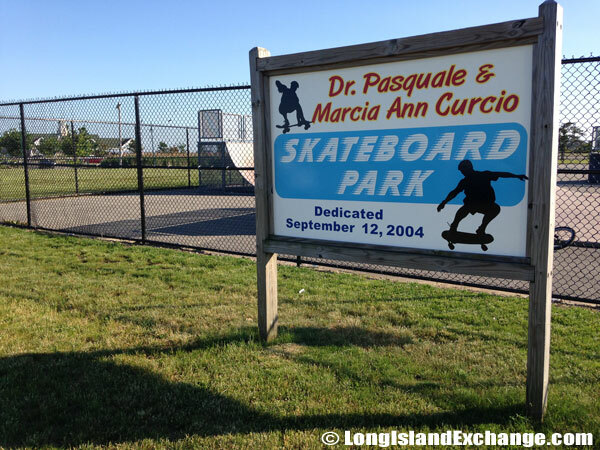 The Tanner skate-park, less than a half-mile from the shoreline, fell into disrepair over time and became unsafe after Hurricane Sandy costing the town upwards of $100,000 to repair and improve. Several houses of worship can be found in Copiague and Bethel AME Church is the oldest African-American Church on Long Island. Local festivals in the area include The Long Island Bluegrass Festival which is held every year mostly in the months of July or August. The Copiague’s Public Library has a total of 150 thousand books, magazines, and related materials. 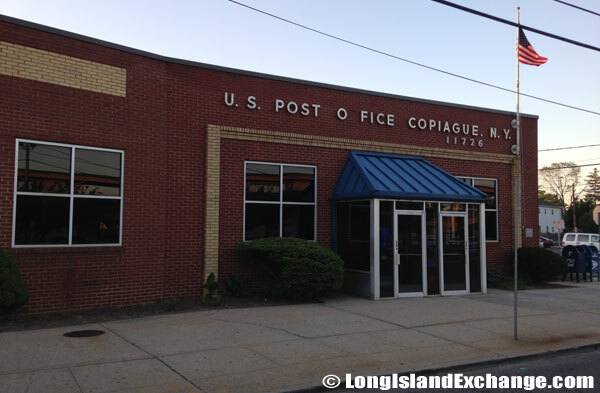 The library is very significant to the residents of Copiague because it provides all information of the area’s history. 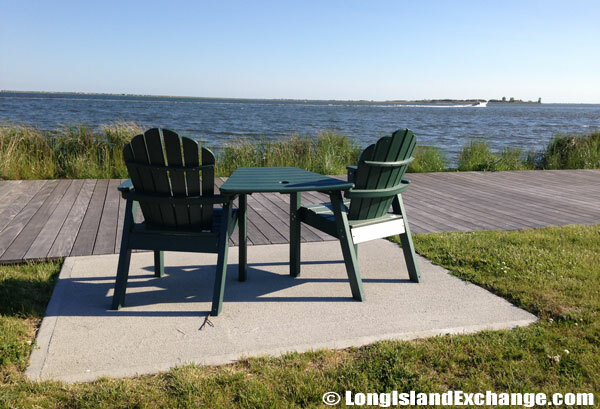 Tanner Park is one of the famous parks in Copiague that is primarily a recreational area which includes a beach located on the Great South Bay.